How many archivists does it take to change a lightbulb? 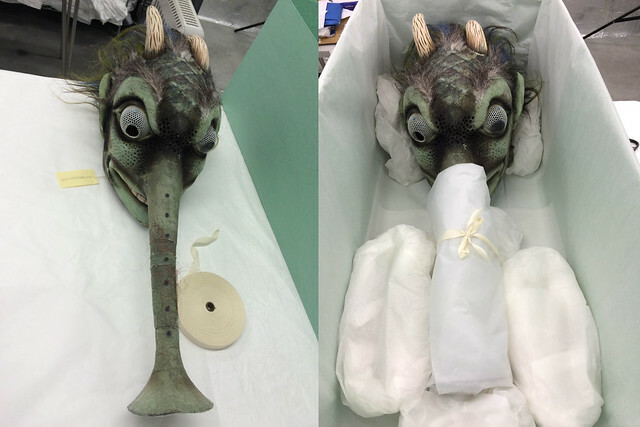 Well, only one actually – but it takes a team effort to pack away objects of the historic ROH Collections, as we prepare to move the Costume, Furniture and Musical Instruments Collections from the current store in Dover to the new Bob and Tamar Manoukian Costume Centre in Thurrock. All the objects we’re moving must be stored to archival standards, to protect them from damage on the move and so prolong their lifespan. The size, shape, material and conservation needs of an object are always taken in to consideration when deciding on how it is to be packed. 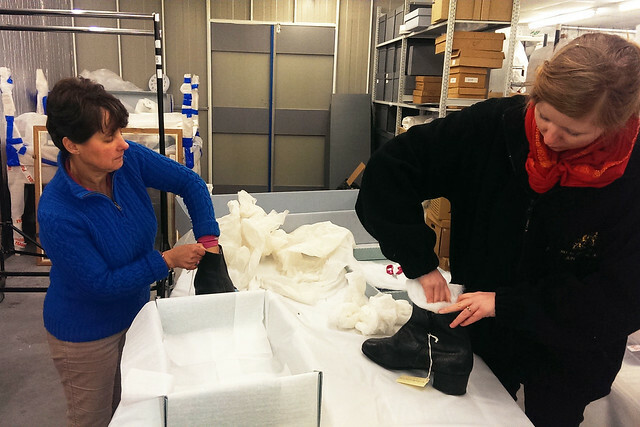 Our many shoes are placed in archival boxes that have been lined with wadding and acid-free tissue paper. The wadding moulds the shoe and takes pressure off the side it is resting on. The space inside the shoes are carefully filled with small rolls of wadding, preserving the shape of the shoe and preventing new creases forming. 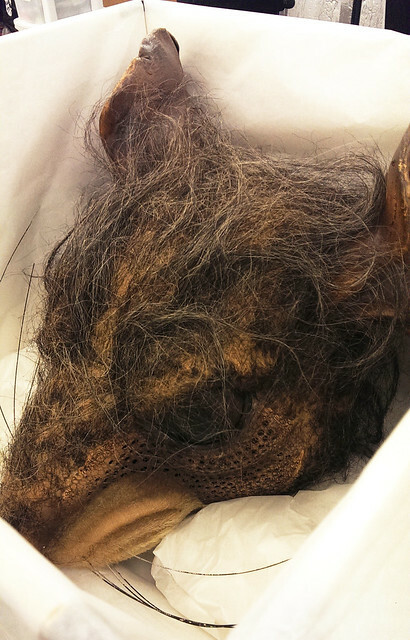 More unusual and large objects, such as a rat’s head mask from The Royal Ballet’s 2003 production of The Sleeping Beauty, are also placed in boxes lined with acid-free tissue paper. Puffs and rolls of acid-free tissue paper are placed around the item to minimize movement in the box during transportation and thus prevent damage to it. Many of the costumes can be hung on hangers, which are then put inside bespoke Tyvek bags. There are over 2,000 costume bags on 155 rails to move. Some costume items, such as cloaks and robes, are too heavy to be hung so they are carefully packed away in to costume boxes. If the costume has to be folded to fit inside the box, rolls of tissue paper are placed in the folds to stop creases forming in the material. A headdress designed by Cecil Beaton for the Covent Garden Opera Company 1963 production of Turandot proved to be a particular challenge. 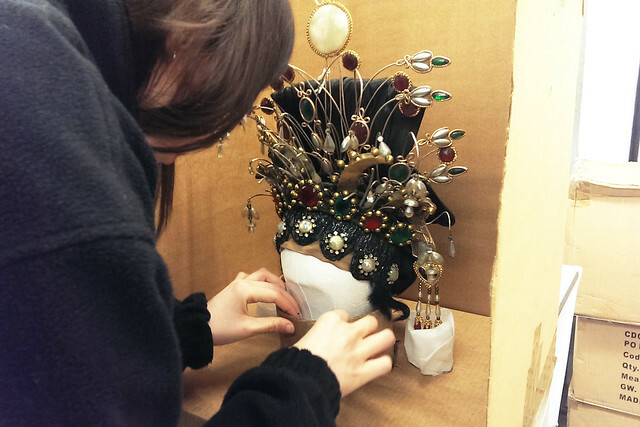 The headdress is stored on a mannequin head and is very large and fragile, with parts sticking out and hanging at all angles. The team had to show a bit of ingenuity to prepare it for transfer. This involved redesigning a box so that that the headdress was held fast during the move whilst at the same time protecting the delicate pendants. Find out more about the Costume and Furniture Collections here. I can only imagine packing away the props and masks would be fun but also scary.